Cleon is available to speak at your organization on a variety of topics relating to jobs and employment. Please send an e-mail to Cleon for more information. You could feel it coming, yet you didn’t do anything. Finally it happens and here you are out of work, now what? Sometimes we get tired of the same old routine or someone else removes you from it. Let’s look at ways to make a change and do what you like. Capital Career Center (185th and NW Walker Road in Beaverton). "What if I don't Know What I Want to Do?" A common dilemna and what to do about it. Nothing worse than a burned interview. You feel bad, you didn’t get what you wanted and it just might smell. Happens all the time so let’s try another one. Sometimes our ingredients aren’t quite the same as others so we have to modify them. "Would You Rather Get Bitten By A Snake On An Airplane Than NETWORK?" Take the Lead- Bridgeport Brew Pub and Bakery, 1313 NW Marshall. Let’s be truthful, you already know what and how to go about this task. Reality is Sometimes it isn’t working. So let’s work on a plan that you help create. Tricky one here, so much depends on the interviewer. This is where your listening skills play such a paramount part. You don’t want to burn it nor under cook it. way to include it in your daily routines. Working or not. All work and no play isn’t usually fun. Let’s talk about taking a break that can also be useful and fun. It can be awfully bland out there searching for your next opportunity. Why not spice up the hunt so it is more fun and less depressing. "What if I don't Know What I Want to Do?" A common dilemna and what to do about it. "What is Networking? Then how do I use it?" "Jobs, Opportunities, How to make yourself standout." "How to master networking so it works for you"
"The BBQ is on, so where are those jobs?" " A Hunting We Will Go"
“The Job Hunt”-#2-Decisions-What do I want to do when I grow up? When searching for that next opportunity"
"The 50 Most Asked Questions from the Newly Unemployed"
by Cleon Cox Order online now! 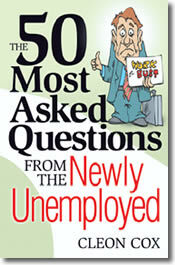 In “The 50 most Asked Questions From The Newly Unemployed,” Cox suggests answers to questions like “where do I go from here, what salary can I expect, where do I find the hidden jobs and MORE! What if I don't know what I want to do? This book answers your questions and gets you started on the road to finding your next opportunity. This book will get you out of the house and on with your next quest. What is worse than unemployment? Being employed where you are unhappy. "Reading "50" is like being with an old friend. It is comfortable,reassuring, and yet thought provoking and complete. It has relevance forall stages of the job search. And it serves as a springboard for further study. "50" can make all the difference." "This is a book that I would give to those who have just got laid off. When answering the question, why has this happened to me? Cox advises the reader not to take it personal, emotionally deal with it, move on. Good advice."